. (1392). تاثیر عوامل دورن سازمانی بر خلاقیت و بهره وری کارکنان : مورد بیمارستان شهدای تجریش. طب و تزکیه, 22(1), 25-32.
. "تاثیر عوامل دورن سازمانی بر خلاقیت و بهره وری کارکنان : مورد بیمارستان شهدای تجریش". طب و تزکیه, 22, 1, 1392, 25-32.
. (1392). 'تاثیر عوامل دورن سازمانی بر خلاقیت و بهره وری کارکنان : مورد بیمارستان شهدای تجریش', طب و تزکیه, 22(1), pp. 25-32.
. تاثیر عوامل دورن سازمانی بر خلاقیت و بهره وری کارکنان : مورد بیمارستان شهدای تجریش. 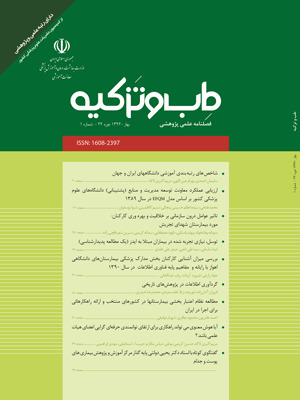 طب و تزکیه, 1392; 22(1): 25-32. Background and Objectives: According to the importance of manpower in all of the organizations and specially hospitals as the most significant center for healthcare provision and considering those evidences assume higher level of creativity in the organizations can lead to higher stage of effectiveness، productivity and satisfaction. This study is conducted to investigate the effect of multi internal organizational factors on creativity and productivity. Method: This was a cross-sectional descriptive analytic study that was conducted on 123 of Shohadaye Tajrish Hospital`s staffs in 1390 that was selected with systematic accidental sampling. The research instrument was a 76-item questionnaire that its face and content validity were determined by expert view. For determination of construct validity in each aspect of the questionnaire، Spearman co-relation was applied. Furthermore، reliability was confirmed using α Chronbach. Data was analyzed by relevant statistical tests on the significant level of 0.05. Results: Results showed that there was a significant statistical relationship among all the aspects of inter- organizational factors and creativity except challenging work. On the other hand، only three dimensions of superior reward، organization reward and adequate resources had a statistical relationship with productivity. Discussion: As organizational culture and creativity are presented as two predictor factors for effectiveness and production، it is essential to be institutionalized in the organizations. It is also important for managers to develop a creative culture inside their organizations that can be interacted positively with productivity.